Alaska is located in the extreme northwest portion of North America. It is by far the largest U.S. state in area, but one of the least populated. Purchased from Russia on April 16, 1867, Alaska became the 49th US state on January 3, 1959. The name "Alaska" is most likely derived from the Aleut Alyeska, meaning "great country", "mainland" or "great land." Motto- "North to the Future"
In 1866 the Russian government offered to sell the territory of Alaska to the United States. 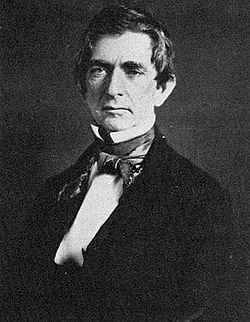 Secretary of State William H. Seward, enthusiastic about the prospect of American expansion, negotiated the deal for the Americans. 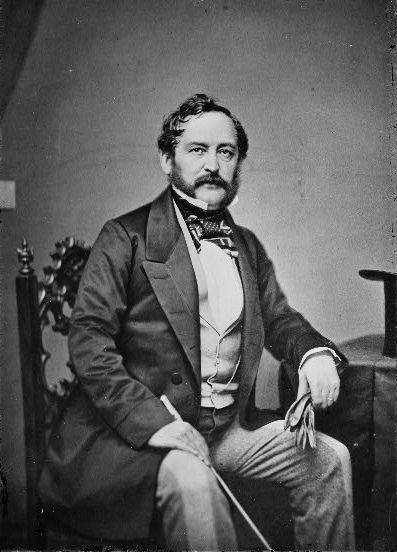 Eduard de Stoekl, Russian Minister to the United States, negotiated for the Russians. On March 30, 1867, the two parties agrees that the United States would pay Russia 7.2 million dollars for the territory of Alaska. For less than 2 cents an acre, the United States acquired nearly 600,000 square miles. Opponents of the Alaska Purchase persisted in calling it "Seward's Folly" or "Seward's Icebox" until 1896, when the great Klondike Gold Rush convinced even the harshest critics that Alaska was a valuable addition to the United States. The purchase of Alaska from Russia cleared the way for the admission of the first noncontiguous territory to the United States. 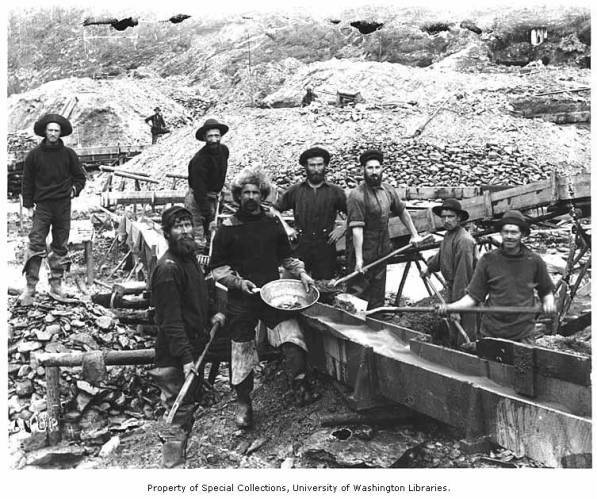 On August 16, 1896 Yukon-area Indians Skookum Jim Mason and Tagish Charlie, along with Seattleite George Carmack found gold in Rabbit Creek, near Dawson, in the Yukon region of Canada. The creek was promptly renamed Bonanza Creek, and many of the locals started staking claims. Gold was literally found all over the place, and most of these early stakeholders (who became known as the "Klondike Kings") became wealthy. Gold mining operation showing miners using gold pan and a sluice-A sluice is a long trough like box set on a slope of about 1:20, through which placer gravel is carried by a stream of water. The sand and gravel are carried away, while most of the gold and other heavy minerals are caught in riffles or a blanket on the floor. Since the Yukon was so remote, word of this find spread relatively slowly for almost a year. 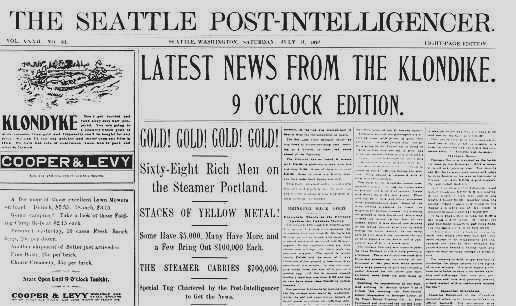 On July 17, 1897, eleven months after the initial discovery of gold, the steamship Portland arrived in Seattle from Dawson with "more than a ton of gold", according to the Seattle Post-Intelligencer. With that pronouncement, the Klondike Gold Rush was on! Within six months, approximately 100,000 gold-seekers set off for the Yukon. 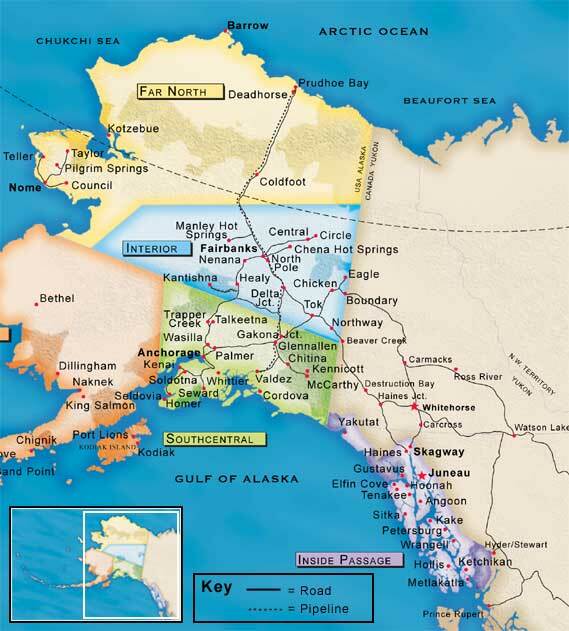 The Gold Rush of the late 19th century put the state on the map, then followed by the Prudhoe Bay oil and gas reservoir discovery in 1968, Alaska quickly began its incredible economic contribution (in the billions) to the U.S. economy. The name Alaska is derived from the Aleut word "Alyeska," meaning "great land." 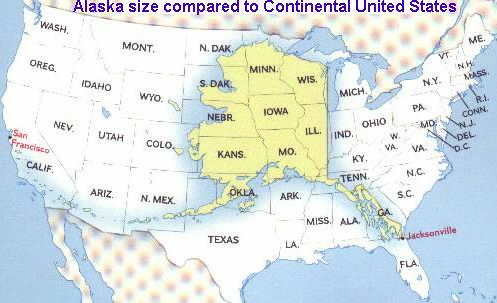 Alaska is the largest state in the Union. It is 1/5th the size of the entire United States. It comprises 586,412 square miles or approximately 365,000,000 acres. Alaska has 6,640 miles of coastline and, including islands, has 33,904 miles of shoreline, 3 million lakes and more than 3,000 rivers. From it's East to West borders it is over 2,400 miles, and from North to South it is over 1,420 miles. It was admitted to the Union as the 49th State on January 3, 1959.Alaska is the last great wilderness in the United States. Civilization has only encroached on about 160,000 acres of its 365 million acres. This is less than 1/20th of 1% of the State, the rest is still untouched wilderness. Anchorage, with a population of about 260,000, is Alaska's largest city.More than half the state's population lives within a radius of 50 miles of Anchorage.Fairbanks is the second largest city, with a population of about 85,000 in the metropolitan area (30,000 within the city limits), followed by Juneau, the state capital, with a population of about 30,000.The next largest communities are the regional centers: Barrow, Bethel, Dillingham, Ketchikan, Kodiak, Kotzebue, Nome, Unalaska, and Valdez. Homer, Kenai, Seward, Sitka, Skagway, Soldotna and Cordova also fall into this collection of towns and villages. Ketchikan has a population of 14,000; the other towns have between 1,000 and 9,000 residents. The Yukon River, almost 2,000 miles long, is the third longest river in the U.S. There are more than 3,000 rivers in Alaska and over 3 million lakes. The largest, Lake Iliamna, encompasses over 1,000 square miles. Alaska has an estimated 100,000 glaciers, ranging from tiny cirque glaciers to huge valley glaciers. There are more active glaciers and ice fields in Alaska than in the rest of the inhabited world. The largest glacier is the Malaspina at 850 square miles. Five percent of the state, or 29,000 square miles, is covered by glaciers. 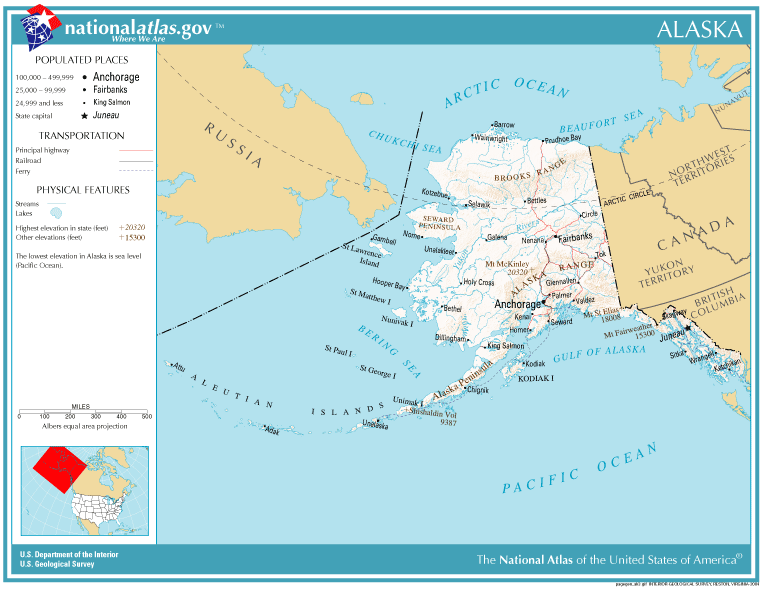 Alaska boasts the northernmost (Point Barrow), the easternmost (Pochnoi Point on Semisopochnoi Island in the Aleutians), and the westernmost (Amatignak Island in the Aleutians) points in the United States. Alaska is part of the "Pacific Ring of Fire," a string of volcanoes that stretches from Asia into North America. It has more than 100 volcanoes and volcanic fields, many of them in the Aleutian Islands. A 1912 eruption created the "Valley of 10,000 Smokes" ,which is now part of Katmai National Park, on the Alaska Peninsula and was the largest 20th century eruption in the world. Mount Spurr and Mount Redoubt, about 100 miles west of Anchorage, erupted in the 1990s. On March 27, 1964, North America’s strongest recorded earthquake, with a moment magnitude of 9.2, rocked central Alaska. Each year Alaska has approximately 5,000 earthquakes, including 1,000 that measure above 3.5 on the Richter scale. Of the ten strongest earthquakes ever recorded in the world, three have occurred in Alaska.